It is essential to treat each person as unique without quickly labeling someone with a permanent diagnosis. People come to see Dr. Gersten for a huge variety of symptoms, but the 2 or 3 symptoms are the tip of the iceberg. Underneath the tip of that iceberg are vast disturbances of total body biochemistry, adrenal stress, and inflammation. By treating the entire “iceberg,” the presenting complaints, the symptoms, almost always are improved or cured. It is not the illness that determines how someone will do in treatment. Psychosocial factors are perhaps the most important. If a person has a sense of purpose or mission, they are likely to do better in treatment. If they are optimistic, they will fare better. If they live with a sense of gratitude, they will approach treatment very differently from those who live with a lack of gratitude. There are a variety of other psychosocial factors that are incredibly important to address. Perhaps the most important ingredient in the healing journey is the doctor-patient relationship. All of these important attitudes for healing can be consciously changed. Dr. Gersten enjoys working with very high levels of complexity, making sense of that complexity, and organizing a rational treatment approach. It is not a shotgun approach. It is important that people coming in for treatment have some idea of the healer's approach, philosophy, and beliefs. And it's important that, before engaging on a comprehensive healing journey, that doctor and patient feel that they are a good fit. Inspiring hope (based on decades of experience) is critical to healing. By the end of the initial evaluation, that relationship ideally is well on its way. When working with a nutritional approach, it is only after the data is interpreted, that a patient begins to fully grasp that Dr. Gersten's approach is holistic in a profound way. The word “holistic” is not a marketing strategy, so people need to be prepared to look at every aspect of their life (at some point in treatment) if they are going to have maximum benefit. But healing starts with hope, belief in the healer, some belief in the healing modality, and a positive doctor-patient relationship. From that positive beginning, determination, honesty, and patience are required by both doctor and patient. The current medical model goes back to Louis Pasteur, the founder of the germ theory. Pasteur's rival was Antoine Bechamp who believed that illness is the result of our internal healing environment. To quote Bechamp, “The diseased, acidic, low-oxygen cellular environment is created by a toxic/nutrient deficient diet, toxic emotions, and a toxic lifestyle.” He believed that this unhealthy internal environment led to disease. When you read the page on the Health Map, you'll see that, in Dr. Gersten's experience, any chronic health problem has a minimum of 7 primary causes (infections, toxicity, malabsorption, genetics, protein deficiency, stress, etc). Those who want to really recover from a chronic illness often go from one clinician to another. Frequently, each clinician has one or two pieces to the whole puzzle. Without addressing all primary causes and repairing the cascade of collapsing dominos (a metaphor for the extensive problems with total body biochemistry in illness), a complete cure is almost impossible. Health, wellness, and recovery from illness requires that we identify the “germ” and kill it, and also to treat the entire internal healing environment. While this may be a new idea for many people, it's complex, but not rocket science. In almost all illness, just as there was a journey into illness, there is a path back to health. If you believe your situation is hopeless, it is more likely to be hopeless. People are often cautioned against having “false hope.” To quote Dr. Bernie Siegel, author of Love, Medicine, and Miracles, “There is no false hope. There is only false no hope.” A comprehensive mind-body approach to healing will almost take people closer to vibrant, total health than will a limited cause-and-effect model of illness. But it is very important that doctor and patient remain open to ideas and treatment directions. We are not lacking for treatment options. In fact, we are bombarded with a vast amount of information of healing, including modalities that we have not even heard about right now. Your challenge is sorting through the vast amount of information on the Internet. There are terrific web sites with great information and there are sites whose information is faulty. Dr. Gersten works with his patients to sort through that vast information, answer his patient's questions about information they have run across, and then come to an educated conclusion about that health information. If a person has a chronic physical problem, they almost always focus on physical treatments, and may even feel offended at recommendations to address the mental/emotional/spiritual dimensions. In every primary care doctor's office at least half the patients in his waiting room have stress-related illness. That does not mean that your problem is “mental.” Stress tends to cause 30 - 50% of the total cause. The mind-body connection is very real. Dr. Gersten's total program includes the use of mental fitness techniques, such as meditation and mental imagery, which will cut stress in half. Those of you with problems with the digestive tract (such as IBS, ulcerative colitis, and crohn's disease) know that, when you get stressed, the stress goes to your GI tract instantly. The illness is not caused by stress, but stress triggers flareups. Do as much research as you can. Then make an informed decision. At any point you can ask your doctor to explain what he thinks is wrong and why he is using a particular approach. Once you meet with the doctor, and hit it off, it's important to take a plunge. Belief in the healing process requires that at some point the patient and doctor are on the same wavelength. When you reach the point where you trust in any healing modality as well as the doctor, you've reached the starting point, namely belief in this phase of your healing journey. 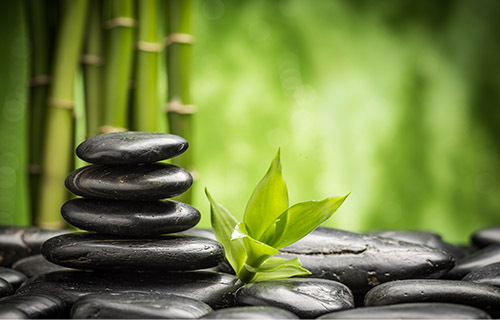 Part of Dr. Gersten's healing philosophy is that addressing and embracing spirituality is part of a holistic approach. By the early 1990’s Americans were flocking to complementary and alternative healthcare practitioners. Research studies revealed that spirituality was the number one reason why people were making this choice. Spirituality deals with life's great questions: 1) What is the purpose of life? 2) Where did I come from? 3) Where do I go after this life? 4) Is there a God or Higher Power? If so, what is my relationship to Him/Her? Without embracing these issues, healing cannot be called "holistic" or “integrative.” Incorporating a spiritual dimension to healing is a natural thing to do, and it facilitates healing of body and mind. Here is one way to think of spirituality and religion: Religion can be compared to a container, like a vase. It deals with rites, rituals, leadership, and buildings. Spirituality is like a liquid that deals with the 4 questions. When the liquid of "spirituality" is poured into the container of "religion," one has a powerful combination. Healing is not simply about treating a condition. It is about treating the person who has a symptom or illness. Healing that addresses spirituality in a practical, open way goes further than an approach that focuses entirely on physical modalities. Treatment usually deals with “problems.” Spirituality goes far beyond dealing with problems. People are seeking spirituality in their healing because, 1) It is important to most people, 2) People feel connected to doctors and other clinicians who share similar beliefs and who are open to hearing a patient’s unique beliefs and experiences, and 3) Addressing spiritual issues facilitates healing and improves quality of life. The graphic at the top of this page is a “yantra,” a visual focus for meditation. What is meditation? It is a practice that helps quiet the mind. 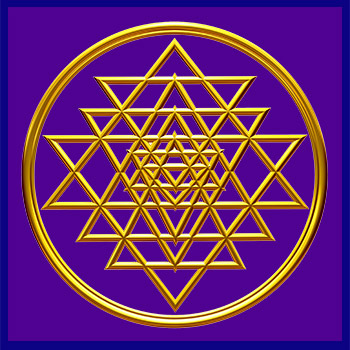 If you’d like, focus on this yantra for a minute…or return any time you’d like. The average person’s mind churns out about 5,000 random thoughts per day. That’s 35,000 thoughts per week, 1,820,000 per year. If you’re 50 years your mind has churned out about 91,000,000 thoughts…so far. The mind picks up its adult speed around age 10. Most of those thoughts are junk…neither good, nor bad. The faster the mind moves, the more stressed out a person feels. There are many ways of thinking about spirituality. For Native Americans and other indigenous people the sense of oneness with Nature is the heart of their spirituality. For Buddhism and Judaism in particular, spirituality is first about human values and character. The five core human values are: truth, integrity or right action, peace, love, and non-violence. A person may have mastered the ability to attain high states of consciousness, but if they have not developed a foundation in values and character, they really have missed the point of spirituality. Neither psychiatry nor psychology has developed a decent model or definition of the “mind,” even though that is what they are treating. I’ve learned a lot from many religions and spiritual texts. From the Vedas I discovered a concept called the “antahkarana,” which means, “tools of the soul.” Those tools are the mind, the intelligence, the ego, the will, and memory. The mind churns out an endless flow of thoughts and desires. The intelligence determines what is true and what the right course of action is. The ego, in the Eastern sense, is the storehouse of beliefs. From the standpoint of Western psychology most of our core beliefs are deeply unconscious. The memory and will are obvious. If we realize that “who we are” is not the mind, we make an instantaneous jump in our consciousness. If we can watch our mind, who is watching? It is either the intelligence or the soul (atma) that is watching. The mind-body connection if very strong and very real. By learning to tame the mind through simple practices, we can dramatically slow down the speed and amount of thoughts that the mind generates, which then decreases our stress. Trying to decrease stress without addressing the role of the mind will lead to partial success. That is why I spend time with my patients, early on, in teaching them how to tame their mind. Because I realized early on in my career that spirituality was important, yet missing in psychiatry, I wrote “Are You Getting Enlightened Or Losing Your Mind?” to help integrate spirituality into psychiatry and medicine.